Many people want to start lifting weights. Or maybe you want to try a boot camp or CrossFit. Exercise can improve your health in many ways. Starting a new training program can improve your athletic performance as well. 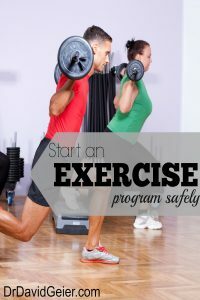 You should take steps to avoid injuries when starting any new program. Work with a qualified personal strength and conditioning trainer. When learning any new program, it is a good idea to work with a fitness trainer. Inquire about your trainer’s experience and certification, such as Certified Strength and Conditioning Specialist (CSCS) from the National Strength and Conditioning Association. Learn correct techniques for every movement. Many people hurt themselves by flailing their arms around or lifting weights off the ground awkwardly. Using perfect technique for each exercise can help you prevent injuries by limiting stress to areas where it shouldn’t be. Plus it will increase results by focusing the stress on the muscles you are trying to build. Start out your training slowly. overuse injuries like stress fractures that can cause them to miss months of training. Likewise, don’t try to lift very heavy weights right away. Pick lower weights that you know you can control and perform as many reps as you can. You can gradually increase your weights with each exercise as you progress. Stop an exercise when you can no longer control the movement. Pushing yourself to your limit with each exercise will help you grow and improve, but you must be able to control your form. You need to be able to safely control the weight. If you lose your form, or if the bar or dumbbell slips, you could suffer a serious injury. Do a cross training workout one or two days each week. Any form of exercise that involves a repetitive motion has this same risk. Over time, it could lead to injury. Repetitive stress on one or a few body parts day after day can build up quickly. For example, jogging seven days a week might not cause any trouble for a few weeks or months. Do it long enough, though, and overuse injuries like stress fractures or tendinitis can occur. The upper body is no different. You don’t necessarily have to give up exercise, though. Just pick a different exercise occasionally.